India-based ethnic apparel brand AKS Clothing has launched its all ‘Leheria Collection’ which it terms as a perfect blend of hot colours and cool fabrics. 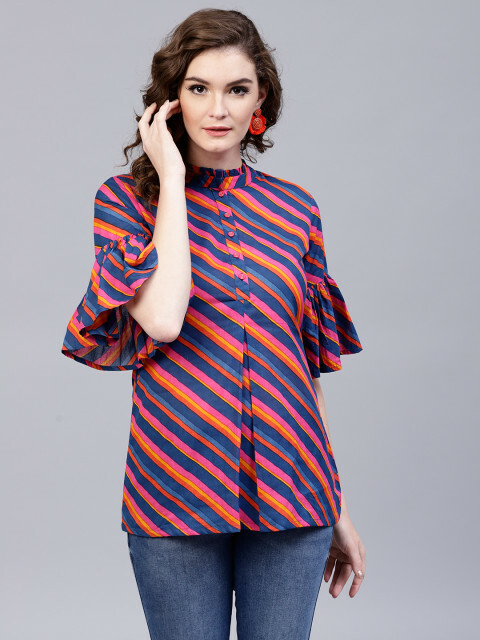 The company says that the idea behind the collection is dissolve the hurdles in life with the vibrant colours that gives an instant lease of enthusiasm to the wearer. The craze around the Rajasthani colours and designs made AKS come up with ‘Leheria Collection’, to spread the reach of rich traditional designs of Rajasthan. The assortment features anarkali brocade yokes, lehengas and cholis, A-line kurtis, straight kurtis, palazzos, maxi dresses, jackets, sarees and tunics. “Instead of imposing traditional on the modern women we focus on bringing them close with the traditional prints and patterns by styling them as per their contemporary needs and on-going trends. And, coming up with Leheria Collection is one such initiative of ours to promote the traditional aesthetics of our Indian tie-dying techniques,” said Nidhi Yadav, Founder and Creative Head of AKS. The wavy diagonal stripes created through the traditional Leheria design technique instantly pops out the beauty of classy yet simple. With festivities around the corner, the new collection is a must have. In another developlment, AKS launched two physical stores in Nagaland last week. Spread over 300 sq. ft. of , the stores have the inclusive range of ethnic and Indo-western clothing on display. The brand will soon launch more store in other regions like Delhi-NCR by the end of this fiscal, as reported.